Brexit: Your rights around work, claiming benefits and life in the UK won’t change unless new laws are passed. This will take time. Read more about Brexit. 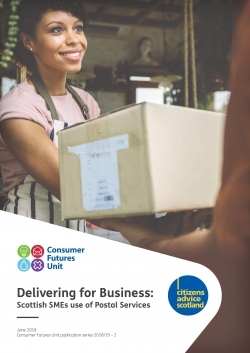 Citizens Advice Scotland conducted research into the use of postal services by Scottish SMEs - looking specifically at whether they have access to a meaningful choice of postal products, services and providers. We also wanted to find out if the current postal market is meeting the needs of Scottish SMEs or if any changes are required to improve the products and services available to these consumers. Postal services, and the Post Office, are vitally important to SMEs. We want to see current levels of service maintained for SMEs. A third of Scottish SMEs have variable or poor quality broadband. We believe there is a need for a statutory telecoms consumer advocate to represent the interests of consumers, including SMEs, as governments work to increase digital connectivity. SMEs in Scotland can be disadvantaged by their location in a number of ways – including limited access to reliable broadband, location-based delivery surcharging and delayed deliveries. We would welcome more rural proofing in general policymaking for SMEs so that location is not a detriment. SMEs value convenience over cost when it comes to choosing a postal supplier, but awareness of suppliers other than Royal Mail is low. While SMEs are generally satisfied with postal services, there are a few areas where improvements may be needed – like better collection services or lower prices. We will highlight these findings with the regulator and postal operators. Volunteer now or contact your local Citizens Advice Bureau.